A burger for a wholesome, healthy, satisfying meal. A sandwich or a burger is probably the most common lunch idea. They are available everywhere and there are million ways to do them. Ranging from the simple cheese sandwich to a mega layered burger – the kind which gives your jaws a tough time, there are endless varieties. I don’t think I need to elaborate anymore. While we rarely get the ready made burger patties, we do quite a bit of sandwiches ourselves – mostly homemade ones. Different days, different kinds depending on the mood, time and cravings. This was created on a day when I craved mushrooms and wanted to do something different with them. Besides the daughter needs variety for her lunch. Gone are the days when she asked for butter and cucumber sandwiches (that phase lasted for 2 whole years), and PBJs. The taste buds have certainly developed and they ask for more. Mushrooms, almond meal and brown rice are the 3 main ingredients here. The rest can be substituted easily. The spices, herbs are for you to change and experiment with. There is no dairy or meat here. With some whole grain bread and fresh vegetables it was a delightful burger and I will be making it more often. Add oil to a flat bottomed pan. Add the chopped herbs, red pepper flakes and the minced garlic. At high heat cook for a minute after the oil heats up and the flakes and the herbs start to sizzle. Add the chopped onions and cook till they are soft and they start to brown at the edges. Add the chopped mushroom, black pepper and salt and cook at high heat till the mushroom releases no more water, about 3-4 minutes. Cool the contents and set aside. In a big bowl, combine almond meal, flax seed meal, hot sauce and the mushy cooked brown rice. (The rice really needs to be overcooked, wet and sticky as I have used this as the main agent to hold the pieces of the mushroom together.) Mush and mix everything together in the bowl. Let the content rest for about 10 minutes. Add the sunflower seeds, cooked mushrooms and the onions from the pan to this bowl. Combine everything together again and divide into four equal portions. Take each portion and roll into a carelessly shaped ball (the mix will be chunky, so you won’t be forming perfect shapes here). Flatten the spheres to form the patties (using wet palms helps here). Place the corn meal/flour/oats in a plate. Place each patty in the corn meal/oats/flour (whatever you have decided to use), and gently press it down so as to make the flour stick on the patty. Do the same with both sides of the patties. Lay the patties on a plate and cover with cling wrap. Let them chill for at least 20 minutes. Heat oil in a flat pan and shallow fry the patties, about 3-4 minutes or until golden brown. Flip them over carefully and cook the other side too. Assemble the burger in a way that pleases you. I grilled the 9 Grain Rolls that I used, with a drizzle of the Rosemary Infused Olive Oil; used some baby spinach from my garden, lettuce, tomatoes and red onions, and had a hearty lunch. Once DD1 came back from school, she gobbled up the second one and asked from where I got the chicken patties; it tasted nothing familiar. Her eyes popped out when I said it was mushroom, for she does not fancy the “fungi” (that’s what she calls it). At least she fancied the burger for she instructed me to pack this for her school lunch. The burger patties will stay good in the refrigerator for a couple of days and may be reheated in the microwave/oven or a pan. I have not tried freezing them yet. They are on their way to ITB: September – Mushroom, Nuts and Herbs in the Bag. Beautiful photos …. and probably the healthiest burger recipe in the world. Hey Soma.. this burger patty is a definite to-do on my list now! One silly question, how do you pack burgers for lunch? Doesn’t the bread become kinda soggy? You pack the patty on the side? Not a silly question. 🙂 I always always toast or grill the bread, sometimes very lightly, but still do it. If you are warming the patty, cool it. Cool the bread and the patty. For if u wrap them hot they will sweat and get soggy. i put the patty in the bread, but pack the greens/salad and the condiments on the side. It is mostly the salad and the spread that gets the sandwich soggy. Beautiful burger! I bet they are very flavorful. Very irresistible burger, simply awesome! 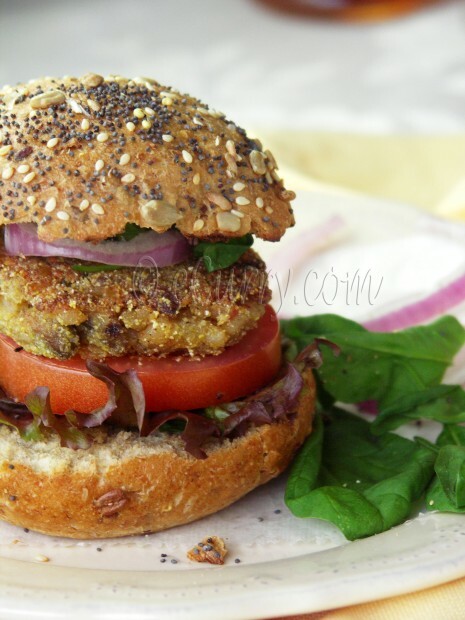 Love mushrooms and this is one healthy burger! I bookmarked the recipe. Burger looks very very inviting! The Burger looks so very tempting! Beautiful Clicks! Awesome burger idea. I don’t care much for mushroom so might replace that with some other veggie. Will try it out and let you know. Looks super!! Nothing like a good home made pattie!! Tomake abong tomar paribar er shokol ke pujor shubhechha janai….khub bhalo kore pujo katiyo..tomader pujo ki hoe gachhe? ?amader ekhane (LA te)tin din hobe…fri-sun…. Fantastic idea, I love it! Will definitely try this one. Thanks for posting! Oooo, now THAT is exactly what I need!! It’s such a beautiful delicious looking and healthy burger! Gorgeous shots as always too! What a fantastic creation, Soma! 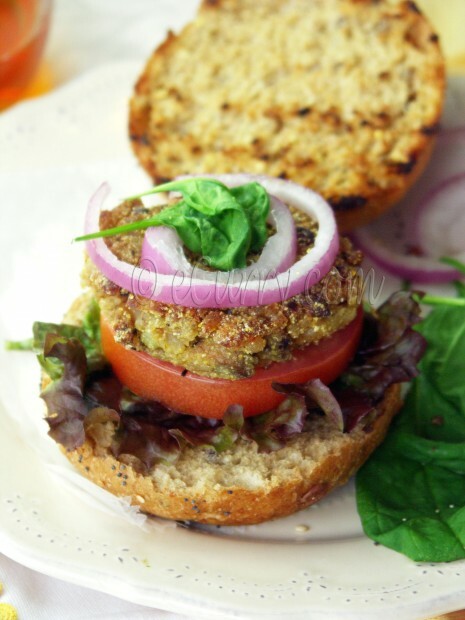 I love a good veggie burger and this one looks full of flavor and filling too. That 9 grain roll looks like the perfect pairing…looks kinda like a multigrain bagel! You got me at mushrooms! Very healthy and delicious! 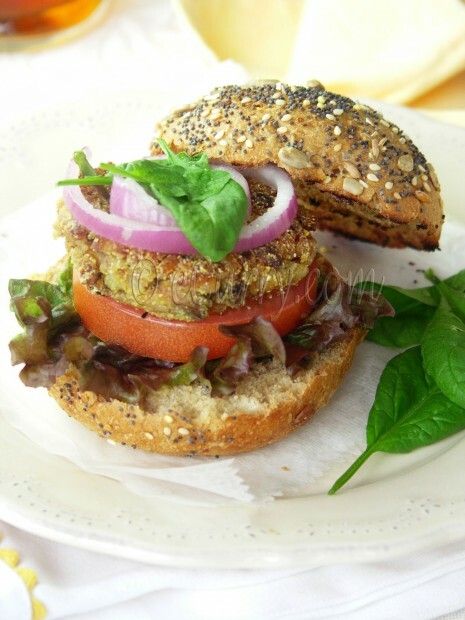 I’ve been looking for good veggie burgers to make at home. The packaged ones have way to many ingredients on the labels! These sound delicious, and the 9-grain rolls look great too. 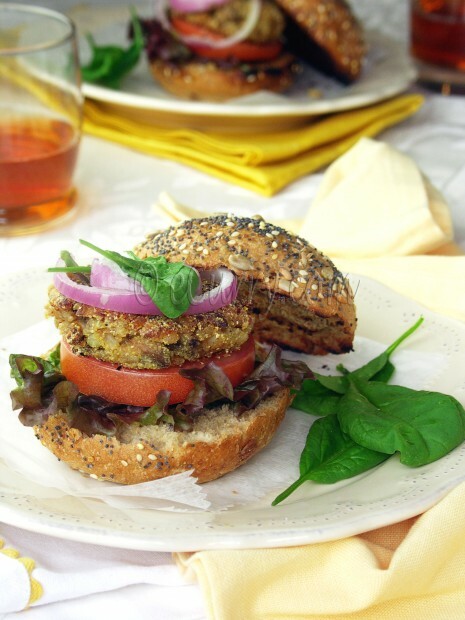 I love hearty veggie burgers like this. So much more interesting than the cardboard frozen ones you find sometimes. This burger sure looks delicious even for a non-mushroom eater like me. I am sure after it is cooked there is hardly any trace of the mushroom flavor in it. Love the addition of almond meal and flax meal in it. A very beautiful burger!! Looks so good! Sorry for my absence! I was very preoccupied with my little munchkin! Anyway, any freakin meat loving motor head for that matter will fall in love with this burger, a picture of pure delight. Yum! What an awesome burger recipe. Thanks for sharing. Wow! And what a great addition of the nuts so that it’s filling and not just delicious! I live in Bangalore and i don’t think it is so easy to get almond meal and flax seed meal. What do i use instead of this? Can i use white rice instead of brown rice. I know a lill less healthy but easy to find! Love ur pics. U have some real good food here!!! Way to go! you do get flaxseed in India. It is called alsi, alasi, jawas, atasi, ali vidai and many others in different languages. Another common name is Linseed. Flaxseed meal is just the powdered seeds. If you still do not find it, use corn flour/corn starch(the ones used in indo chinese cooking) to bind it. Almond meal is powdered almond. So if you do not get it in powder form, grind up the nuts. You can use powdered peanut too, but it will have a different flavor. the texture and flavor of brown rice is very different from white rice. It give a very nutty flavor and texture. If you do not get brown rice, it is better to use some mashed up beans (kidney, pinto, blackeyed peas, or best black beans) instead of white rice. it’s going in my to do list….as my DD1 too doesn’t eat/like mushrooms…so this is one veggie I have to disguise to make her eat…..nice clicks & I’m sure tasty too as anything with mushrooms I just love…. This looks delicious. We also appreciate the addition of mushrooms. Have you tried FungusAmongUs products? We offer organic dried mushrooms including the smoky Porcini, the versatile Shiitake, and our organic Mushroom Medley that will add a new dimension to pasta, rice, and any dish that calls for mushrooms. I just wanted to thank you for this recipe! I made it last night for my family but I used Shiitake mushrooms and we all loved it. I will have to try with ports next time.